NCVO, the Institute of Fundraising, Charities Aid Foundation and the Charity Retail Association have worked in collaboration to look at how charities have been fundraising around the coin so far and think about how you can maximise donations of the round pound in the coming months. The new, 12-sided pound coin was launched on the 28 March and has provided fundraisers with an opportunity to cash in on the old coin. With the old, round pound ceasing to be legal tender on the 15 October 2017, there is potential for charities to benefit from the public’s increasing awareness of the old pound being removed from circulation. With more new pound coins coming into circulation every day, charities have been encouraging supporters to donate an old pound coin for every new one they receive – using #PoundforPound to raise awareness on Twitter. Other organisations have been stirring people into action by reminding them that they should donate their old coins before they are removed from circulation in October. Raffles and prize draws have been one of the more creative ways charities have been fundraising around the new pound. Think about whether your organisation could sell raffle tickets for a round pound and supporters could win prizes or even more new pounds. Blesma have been running a prize draw using the line ‘trade your old pounds in for a chance to win a thousand new ones,’ and Sight Support Derbyshire have been running a £1 lottery. Macmillan Cancer has partnered up with Poundland and is urging supporters to donate their pounds in collection boxes across UK stores. There are a huge number of shops on the high-street which focus on selling items for £1 or have ‘pound’ in their name; how could your charity take advantage of this on a local or national level? Fundraising around the new pound coin presents a brilliant opportunity to get schools, libraries or kids’ clubs involved in campaigns. If your charity works with children, this is a good chance to inspire people to donate their old pounds by planning something creative. See who can make the tallest pound pile and longest pound line or get kids involved by making pictures out of their old pounds. There could be potential to maximise fundraising over the summer holidays! Collection boxes are one of the most versatile fundraising tools. During the pound for pound campaign, we’ve seen charities offering supporters collection boxes or envelopes to fill with old pounds. Distributing collection boxes to local businesses and encouraging supporters on Twitter to donate their old pounds in specific locations is another popular idea. Think about whether you could adapt your collection boxes to reflect the campaign. 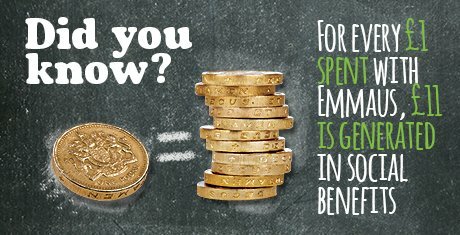 If your charity has shops, publicise the fact that supporters can spend or donate their old pound coins in store. It’s estimated that there is around £1.3bn stored up in piggy banks and jars across the UK and over a third of this is likely to be made up of round pounds. Consider how you could incorporate the idea of hidden pounds into your campaigning strategy or think of an interesting way for supporters to donate from piggy banks. If you’re planning some cash fundraising around the new coin, make sure you check if your charity is eligible for the Gift Aid Small Donations Scheme. The scheme enables charities to claim a Gift Aid style top-up of 25% on cash donations such as bucket collections, without the need for written declarations from donors (however, it’s worth noting that you can’t claim on all activities, such as raffles). Although you need to have claimed some normal Gift Aid on other donations, there are new rules which make it easier for charities to sign up. Charities have been promoting this message when fundraising around the new pound; Rythmix Music have been using an updated version of the popular Gift Aid image depicting the extra value of the pound when donated using Gift Aid. We’ve been encouraging charities and individuals to get behind the hashtag #PoundforPound to promote their fundraising around the new coin. As the public becomes increasingly aware that the old coin will be removed from circulation in October, there are likely to be further opportunities for charities looking for donations in the coming months – we will be endorsing different hashtags in the run up to the deadline. Make sure you take a look at the Royal Mint’s Repatriation Round Pound Stakeholder Toolkit which includes downloadable resources, imagery and the donation bucket gif for charities to use on social media. i did not know that you could claim gift aid from bucket rattle collection. will that include bag packing in super market stores.